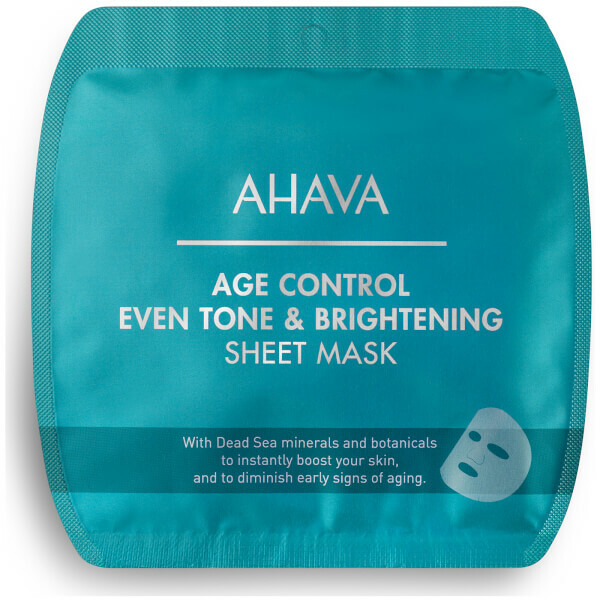 Improve your skin's overall appearance with AHAVA Age Control Even Tone & Brightening Sheet Mask; a radiance-renewing treatment that works to revive and revitalise, whilst targeting signs of ageing. Fortified with Hyaluronic Acid and Osmoter™ (the brand's proprietary blend of Dead Sea Minerals), the sheet mask adheres closely to the face for maximum effectiveness; it moisturises and hydrates, as it refines skin tone and texture. Tired, dull and sun damaged skin looks smooth and youthful with a luminous glow. Paraben, sulphate and phthalate free. Apply on clean skin. Gently unfold the sheet mask and place it on face. Adjust the sheet to customs fit your face. Leave on for 15-20 minutes. Relax and enjoy. Take off the mask and massage in the remains of the serum for maximum benefits. Aqua (Mineral Spring Water), Glycerin, Olea Europaea (Olive) Fruit Oil, Propylene Glycol, Potassium Azeloyl Diglycinate, Phenoxyethanol, Citrus Aurantium Dulcis (Orange) Fruit Extract, Sodium Hyaluronate (Hyaluronic Acid Salt), Allantoin, Parfum (Fragrance), Xanthan Gum, Citric Acid, Maris Aqua (Dead Sea Water), Tetrasodium EDTA, Tocopheryl (Vitamin E) Acetate, Chlorphenesin, Panthenol (Pro-Vitamin B5), Helianthus Annus (Sun Flower) Seed Oil, Camellia Sinensis (Green Tea) Leaf Extract, Dunaliella Salina (Dead Sea Alga) Extract, Potassium Sorbate, Sodium Benzoate, Retinyl (Vitamin A) Palmitate, Benzyl Benzoate, Coumarin, Hydroxyisohexyl 3-Cyclohexene Carboxaldehyde, Linalool.